The weather is warming up, so you know what that means – it’s almost time to begin spring work! We will be starting spring work construction items very shortly. As new Lombardo homeowners, you may have questions regarding spring work. This blog post will help you know what to expect over the next few months. We know what you’re wondering: “When can I expect my spring work to be completed?” Our goal is to have all spring work completed on homes built during the winter months before July 31. We understand that everyone is very excited when the first signs of warm weather come our way – we are, too! That’s why we want to remind you of the process in which we will be completing the spring work for you and your neighbors. 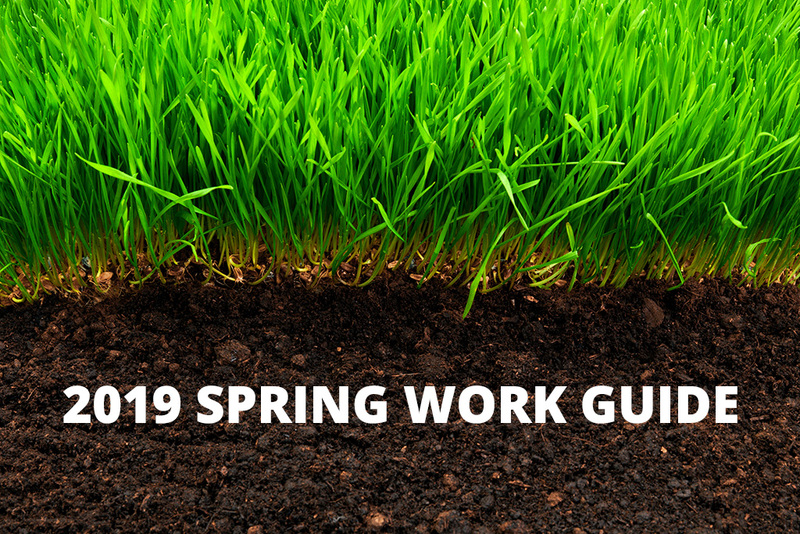 Before we dive into the nitty-gritty details about spring work, we need to remind you about the municipality rules we follow and how that affects the work we complete on homes. As we enter the spring season, the local municipality requires us to clear all temporary certificates of occupancy from homes that closed in the winter. However, as newly built homes are constructed, the municipality requires us to completely install all exterior work and obtain full certificate of occupancy to ensure their closing promise is met. That’s why you may see your neighbor receive a driveway or a final grade prior to the completion of your spring work. This is something we cannot control. One last thing: Remember the saying, “April showers bring May flowers”? We all know that rain in Michigan continues well beyond April 30. For us, that can cause delays in our spring work schedule. In fact, the major contributing factor to getting spring work scheduled and completed is the weather. We ask that you be patient as we try to utilize as many of the good days as possible. In order to meet or exceed your expectations, we want to be sure the work is done right the first time, and it is imperative that soil conditions and temperatures are optimal and conducive to complete concrete work. Step #1: Contact the Homeowner. Homeowners will be contacted 48 hours prior to removing temporary driveways for concrete installation. At this time, please move any vehicles parked in the garage or driveway to the opposite side of the road in front of your home. Vehicles will not be able to be parked on the driveway or in the garage for approximately 10-14 days once the removal begins. Step #2: Remove all temporary drives and walkways. This includes cutting out of the grade for the permanent placement of concrete and the removing of temporary material. Step #3: Exterior Concrete. This includes any driveways, sidewalks and porches, and may take 3 days for preparation, city inspection, and placement of the concrete (assuming Mother Nature cooperates and we have no rain delays). The concrete needs time to cure, so please DO NOT walk on concrete the day of placement, and keep vehicles off the driveway for at least 10 days. Step #4: Final Grading and Debris Removal. After all concrete is poured and cured (10 days minimum after pouring), the grading will be completed to comply with the elevations on the plot plan. Your plot plan has been specifically designed to allow for proper drainage away from your home into swales and/or catch basins. Once the final grade is complete, an engineering company will verify the accuracy of the field conditions to the approved plot plan. After inspecting the grade, the engineer will provide Lombardo Homes with a Grade Certificate approving the conditions of your home’s grade. Step #5: Sod and Irrigation. If your sod and irrigation are being installed by Lombardo Homes, work will begin after the municipality approves your home’s grade. The municipality inspects the grade after we submit the Grade Certificate we received from the engineering company. Your irrigation system will be installed first, followed by the sod. Sod needs to be watered 2-3 times daily for the first 2-3 weeks in order for it to be installed properly, so your irrigation controller will be set accordingly by the landscape contractor at time of installation. Once the 3-week period is completed, please turn back the watering durations as recommended by a Lombardo representative or landscape contractor. Wait at least 10-14 days before you mow your new lawn. When it is time to mow your lawn, your mower needs to be at least 3” high to avoid root damage and browning. Some areas may not be rooted yet, so take the mower slowly the first few times you mow. Keep grass clippings and leaves off new lawns for the first year. Step #6: Landscaping. If you selected a landscaping option with us, the work on it will begin once sod and irrigation installation is complete. Street Trees: Street trees that are installed in the spring need water and TLC from the homeowner. Please water these street trees throughout the summer – approximately 5 gallons per day for the first 2 weeks and 10 gallons per week thereafter. Homeowner Requests/Additional Work: Some homeowners may wish to have additional exterior work done on their home while the contractors are completing the spring work. We do not want to deter any requests, but no additional work can be done until after the full certificate of occupancy has been obtained. Winterization: When winterizing your irrigation system, you must use the irrigation contractor who installed your system to perform the winterization in order to uphold your warranty. Any other contractor used will void your warranty. Spring Work Schedule: The completion of spring work may NOT necessarily be done in any particular order (i.e. order of purchase, closing or neighborhood). We know you’re anxious to have your spring work completed, and we’re trying to work as efficiently as possible to get everything wrapped up in a timely fashion. You can track our progress and monitor when we plan on starting in your neighborhood by following the spring work schedule on our website.